Thank you for thinking of us, Ronna! The Santa’s Elves Project is an effort to bring hope and joy to the holiday season for Maine families impacted by cancer. 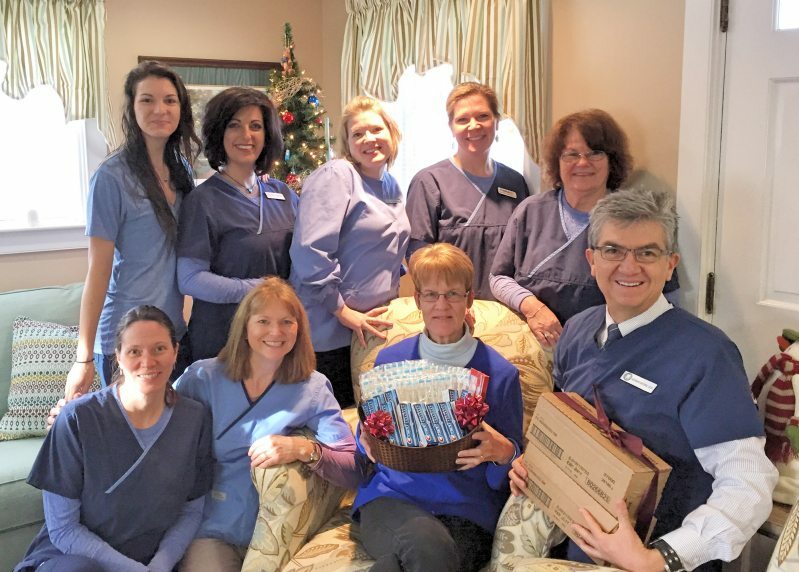 Ronna Emery, a patient at Seasons of Smiles Dental, accepted stocking stuffers for this project. Her daughter, Dawn Emery, is the head elf in organizing donations and there is still time to donate to lift spirits for this Christmas. The Santa’s Elves Project began in 2012 when a young girl reached out asking how she could help children whose parents were battling the disease. She had lost her father and knew too well the difficulties families face. The first year a few families were identified by hospital social workers. Today the project has grown to also include single individuals without family support. The locations of these families are not shared, but please know that they are from all over our state. In addition to receiving lists from the Patient Navigator at Maine Medical Center in Scarborough, the project now also receives lists from the Patient Navigator at the Harold Alfond Center in Augusta. These centers see patients from all across Maine. The Santa’s Elves Project is NOT just about gift giving. It is about sharing a spirit of hope and goodwill. Thank you for being an elf! If you are interested in donating please click Santa’s Elves Project. UPDATE: While there are very few specific items left on the list – we will be providing over 50 stockings through the Santa’s Elves Project. Please consider a donation of necessary and/or fun items for stockings for all ages. If you would like to make a donation toward stockings and stuffers please indicate that at the bottom “Stocking” section in the google doc at this link, Santa’s Elves Project. THANK YOU!! WRAPPING: If you are interested in helping to wrap and prepare gifts and stockings in Santa’s Workshop click here. Other questions please email the head elf, dawn.emery@cancer.org or the American Cancer Society. Seasons of Smiles Dental sends best wishes to all of those involved in Santa’s Elves Project.